At the start of December, Fitzpatricks Shoes on Grafton Street celebrated its 50th birthday and, at their anniversary event, I fell for a pair of leather Hunter Culford boots. These tall boots are a little smarter than your average biker boot and therefore a bit more versatile. I didn't want to spend €300+ so it was a stroke of luck to spot their dupe in the form of these leather Magician Class boots from Clarks, which at about €140 were less than half the price of the Hunters. This minor triumph coincided with the death of two favourite but ancient pairs of shoes and so, triggered a few more copycat purchases throughout December. 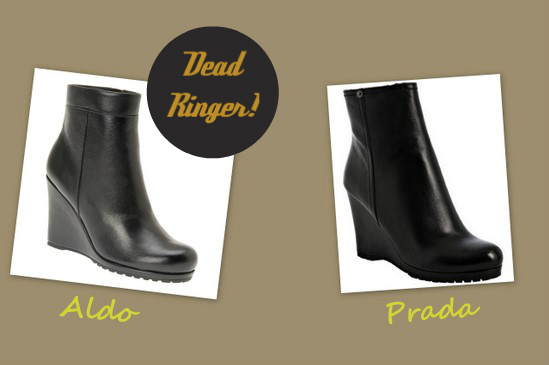 Next up were these Aldo black leather wedges -- a dead ringer for the Prada Sport version but, at €100, about €500 cheaper. Next, I snapped up these fleece-lined, buckle-front boots from Penneys/Primark which are clearly influenced by the Burberry Prorsum boots, right down to the 5 inch heels and rubber platform. Yes, the Burberry ones are much nicer (and made from leather and shearling) but they also carry a price tag of €895 (on Net-a-Porter, where they're now sold out), compared to just €24! Honestly, the ones on the right are 5-inchers too, you just can't see it thanks to my dodgy photography! This last pair is my favourite and were a Christmas present from Mr Fluff (with help from the fabulous Rosemary MacCabe, who has them in three colours!). With their chunky stacked heel, almond shaped toe and zip tassel, these Buffalo boots (€165) are an obvious homage to the Acne version (about €370). 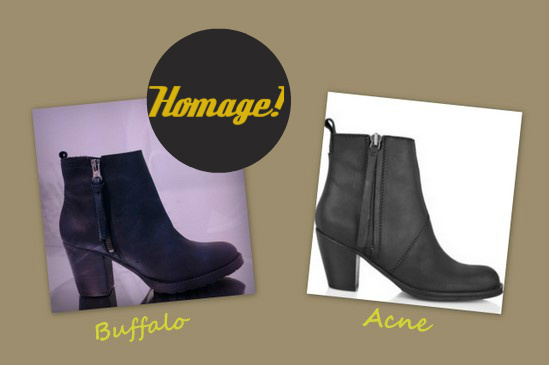 Even the name pays tribute: the Acne boots are called Pistol, while the Buffalo's are named Bullet. These are the most amazingly versatile boot and so easy to wear. If I had my very own money tree I would elect to be kitted out head-to-toe in designer originals at all times but, until I can convince it to grow, I'm delighted to get the look for less. What about you, are you partial to a good designer dupe? Those Buffalo ones are also very similar to some Kurt Geiger ones I spotted in BTs the other day! I think I actually prefer the Clarks boots- that would be a first. And the Aldo booties are IDENTICAL. Great work dear Emma. I agree with little t about those Clarks boots = they are identical. I think Clarks have been trying to up their game in the fashion stakes. I love those motorcycle boots! Anything tough and with an edge is a win in my book. It's amazing how much these boots are right on! Who needs to spend thousands when you can find lovelies like these that are just as gorgeous! Those Aldo ones are remarkable!! Hey Emma! Thanks for stopping by to see me :) You've found some fab high street steals! The buffalo boots are very similar to the Topshop ones I have! I love the last pair from Aldo! I feel an immense sense of satisfaction when I find a cheaper pair at a fraction of the price! Great blog Emma, I have a black boot fetish. I'll check out those Clarks ones tomorrow. I do love your knockoffs. You did a great job. 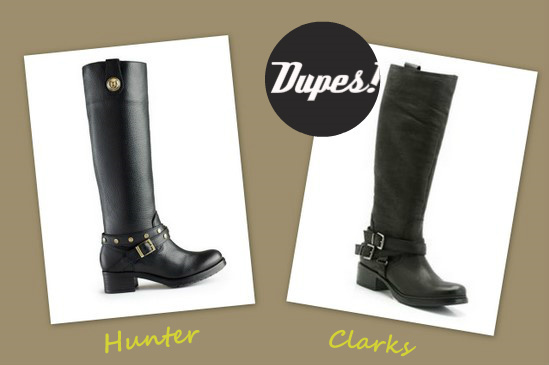 The last one is a good dupe for the Rag and Bones booties I so love. I have those Penney's boots, but I only paid €9 for them. They were labelled full price but scanned in at €9 so I'm not sure what was going on but even more bargainous for me. Love the Penneys and Buffalo pairs! I do lust after designer but I def feel a lot more like I've achieved something when I get lookalikes for a fraction of the price! Sometimes nicer too! So cute! I love a classic pair of black boots.If you are like me very much in love ugg-sequin-boots then welcome to your return visit. At the start of December, Fitzpatricks Shoes on Grafton Street celebrated its 50th birthday and, at their anniversary event, I fell for a pair of leather Hunter Culford Clarks Shoes Sale boots. These tall boots are a little smarter than your average biker boot and therefore a bit more versatile.